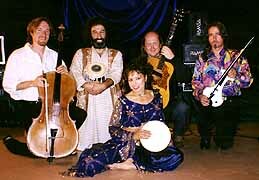 Sunday, May 7, 2000, 7 p.m., Ancient Future Trio, Benefit for Himalayan Fair, King Middle School, Berkeley, CA. Tuesday, August 15 through Thursday, August 17, Ustad Habib Khan (sitar), Matthew Montfort, (scalloped fretboard guitar), Atlantis (an amazing club reviewed online with aquariums everywhere, including a circuclar piranha tank that people dance on! ), Beirut, Lebanon. Saturday, October 14, 1 p.m. to 4 p.m., Diwali Celebration featuring an Indian Orchestra including students of Ustad Habib Khan followed by Indian Jazz featuring Ustad Habib Khan (sitar), Matthew Montfort (scalloped fretboard guitar) and Patti Weiss (violin), at Great America Park, Santa Clara, CA. Tix: $29.99 adv., $39.99 door. Contact: 510-657-0396. December, 2000, Tour of India with Emam and Friends.